Friday afternoon, IU head coach Archie Miller provided updates on the two Hoosiers that sat out the first exhibition for precautionary reasons. Freshman guard Al Durham (hamstring) and senior forward Collin Hartman (ankle) have been progressing and could both see playing time in Sunday’s home matinee with the University of Indianapolis. Hartman was “pretty much a full go for a good portion of (Friday) practice” on Friday, according to Miller, and will “probably” be available on Sunday. In the exhibition win over Marian, Indiana started a three-guard lineup of Josh Newkirk, Devonte Green and Robert Johnson. With Indiana’s lack of frontcourt depth, Miller has been using guard-dominant lineups to try and gain an offensive edge. In the frontcourt, Miller is hoping that senior Collin Hartman and junior Juwan Morgan can find chemistry playing together. Although both are upperclassmen, injuries have prevented Hartman and Morgan from playing in tandem since the 2015-16 season. Unlike Marian University, the Division II University of Indianapolis Greyhounds figures to provide Indiana with a more formidable challenge. The Greyhounds are ranked as the No. 19 team in Division II by DII Bulletin and have reached the DII NCAA Tournament in six of the past seven seasons. Sunday will mark the second exhibition at Assembly Hall between the Hoosiers and Greyhounds in the last four seasons. 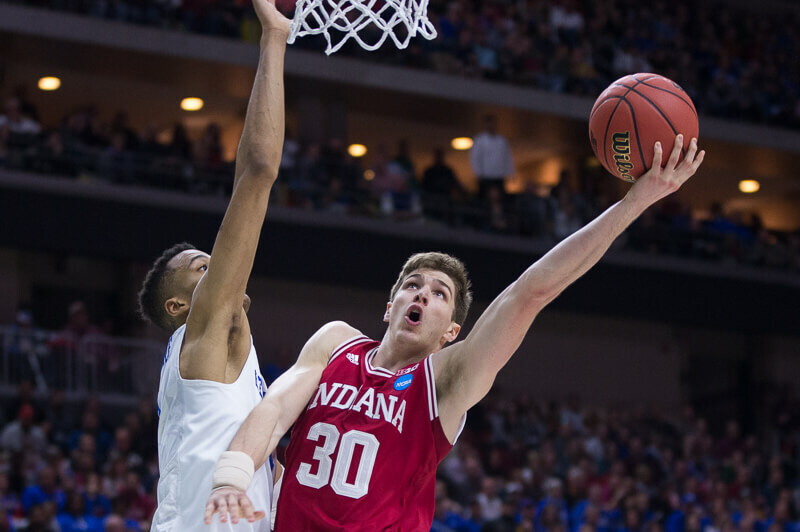 The Hoosiers won the prior meeting, 76-63, on Nov. 10, 2014. Having been a Dallas Cowboys fan my whole life I feel like I have a little insight into hamstring injuries, as they seem to have them every. single. year! Those things just don’t go away. Hamstrings and backs are the two injuries that seem to just “happen” with no real indication that something went wrong, and they’re just recurring nightmares. Hope Durham gets through this thing. Another fun night at Assembly Hall! I love to watch this group of Hoosiers play. So many unknowns, so many possibilities. This is fun!